As my son gets older and takes on more interesting challenges, it’s been interesting learning a bit how his mind works and what interests him. Currently, he has an interest in film production. 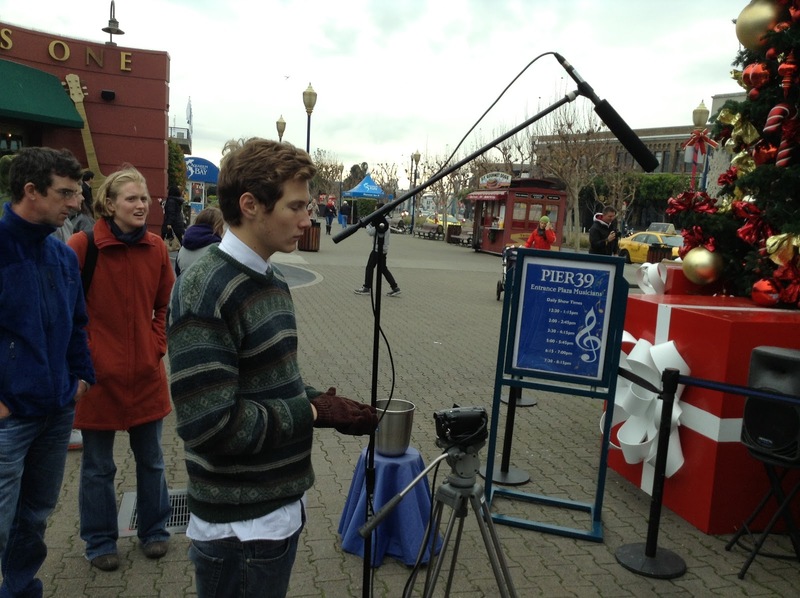 This past weekend, he told me that he needed to do some work for his final in Film, and he decided he wanted to do something where he interviewed street performers in San Francisco, specifically the stretch between Fisherman’s Wharf and Pier 39. Seeing as I really only have a handful of these opportunities left (he’s a Junior in high school now; three more semesters and he’ll be graduated and off to college), I wanted to help him meet his objectives. At first, there was some resistance. “Dad, it’s OK, I don’t need help, I can do this on my own!” Well, of course you can, dude, but that’s not why I’m asking to come along. I wanted to see if there were ways I could see how he works and understand what he does, and in the process, be of some assistance to him (and sure, keep an eye on him, just a little… I’m a Dad, cut me some slack here 😉 ). I finally swayed him with some simple words. “You handle the vision and the talking. I’ll be your roadie.” Meaning, I’ll carry all of the gear for you, and you focus on finding the people you want to film and talking to them. He liked the sound of that, and thus, we were off to the City. Seeing as it was a cold, foggy Saturday (typical for San Francisco) and expected to rain (not as typical) we were concerned that there might not be enough people to interview in the time we had allotted, so I offered to do some advanced scouting with him. As we walked towards Fisherman’s Wharf, he noticed a Rastafarian bongo player setting up with a coffee can for tips. My son walked up to him and asked him if he could film him and use him in his project. No answer. Stone silence but him playing his drums. I waited to see how my son would react, and what he would do. Would he ask again? Would he move on? Do something else? I realized this was a different level of communication for my son than he was used to, and decided that this was a time that a “Seasoned roadie” could offer some assistance. I reached in my pocket, took out a few dollar bills, placed them in the drummer’s coffee can and asked him the same question. He lit up a bit and said “sure, what would you like to know?” With that, we set up the microphone and camera, and Nick did a quick and somewhat stilted interview with the drummer. Not real communicative, but that’s OK, we have to start somewhere. As we walked down Fisherman’s wharf several times, we noticed there weren’t any performers out. Was it the weather? Were we just early? What could we do as a contingency plan. It was here I suggested to my son that, maybe, talking to some people on the street about their experiences with street performers might prove to be interesting. It would offer a different perspective to his project. He thought about it for a minute and said, “sure, let’s give that a try”. We set up the gear again, and we waited. Most people just walked past us hurriedly, but a couple of people did stop to talk with us. After about ten minutes, he decided we should take a look farther down the wharf and back to Pier 39. When we made it back to Pier 39, there was a performer with a Chapman Stick. I lit up at this, since I was very familiar with the instrument, and maybe my fan boy-ness got the better of me, but I suggested that this would be a great person to talk to. Since he was also set up in a prime spot right outside of Pier 39, I figured he was likely a professional who rented the space (turns out I was correct with that assumption). I also figured, if I could strike up a conversation with him about his instrument and what I already knew about it, that might work in our favor, too. I mentioned how much it blew me away when I first heard Tony Levin playing the Chapman Stick in the early 80’s with King Crimson, and of curse the performer was familiar and we talked about other musicians who likewise used the instrument. thus, when we asked if we could interview him for my son’s project, he was very gracious and let us record several numbers and he provided a lot of great interview commentary. As we walked a bit further back towards Fishermans’ Wharf, I noticed a lady and a gentleman get out of their car on a side street in Dickens’ era garb. Performers? Certainly. Street performers? Hmmm, maybe not, they were near the Cannery, and that has a pretty swank hotel in it. My guess is they were performers for the hotel by the level of their outfits, but I figured, hey, they’re here, let’s see if they’ll talk to us. My son agreed, and we went over to chat with them. Turns out they were waiting for another member of their group, and yes, they worked for the hotel, but they were happy to talk to us about what they did, and why they enjoyed performing here particularly, and when their third compatriot arrived, they sang a song for my son to film. As we were feeling pretty flush with the excitement of capturing two good interview subjects, we walked back to the wharf and noticed an elderly man dressed like he was from the Roaring Twenties performing a magic act on a portable table. MY son looked at me, winked and said “let me handle this one!” He went up and talked to the man and asked if he’d be willing to be interviewed. the magician said sure, but not for free. I casually handed my son $10, and motioned to the box on the table. He put in the $10 and then the magician said he’d be happy to perform his entire act for him, provided he’d be willing to send him a copy of the footage (sure thing!). After filming this, it was starting to rain, and we figured that this was going to be it for the day. As we were walking back to the car, my son saw, across the street, one of the guys he really wanted to interview… the elusive and legendary “Bush Man”. This guy is famous (and infamous) for scaring and freaking out tourists, and he would have definitely made for a fun part of the project, but with the rain coming down and not wanting to risk damaging his equipment, he decided to let it go. All was not lost, however, since just around the corner, under a protective awning, one of the “Gold Statue Dancers” was there. For those not familiar with the “Statue dancers”, they typically stand perfectly still until someone steps up and drops some money into their cup, and then they start dancing in a robotic fashion. This one stood on top of a milk crate, and incorporated the crate into the performance, actually sliding and stepping with it (quite proficiently, I might add). At first I was leery, thinking this guy wouldn’t want to be interviewed, but my son, having seen how the rest of the day had gone, decided to give it a try. He walked up, dropped a $5 into the dancers cup and asked if he could ask him some questions. Gold Statue Dancer Man turned out to be the most animated and entertaining of all the interviews, as well as the longest. minder to me that “playing the roadie” can be a good metaphor for good testing, both in software and in film production.